Nothing can seem more cool or glamorous than the life of a rock star touring the country night after night, rocking arenas and clubs, millions of fans, and all the fun that comes with it! The key to throwing a rock star style party is to dream big and think large to pull of the style, glitz and energy of a Rock Star Theme Party! This style of party requires a decent budget and big ideas to pull off. 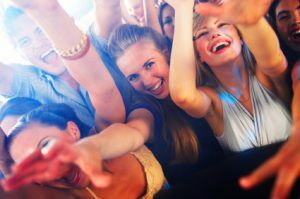 Creativeness in thinking of how to create a larger than life event full of energy, screaming fans, and awesome music will help make your rock star themed party larger than life. We’ll cover the aspects of planning a party like a rock star party including music, dress, where you can buy life size rock star and celebrity cardboard cutouts, resources, pictures and ideas for thinking and dreaming like a rock star. Rockstar Dress, What to Wear? Dressing like a rockstar makes you think outside the box. Edgy, larger than life, worn in, dangerous all encompass the idea of a rockstar. Dressing like you’ve been all over the country and the world and picking up the coolest accessories in each place is the vibe that you are going for. Leather jackets and pants, bright bold big patterns, rocked out hair with hairspray and gel. Larger than life makeup that helps the audience see how you are from the stage, larger than life jewelry and symbols of the lifestyle of a rockstar all help to create the vibe and energy that you want. Another cool element to add in are backstage passes. These are what fans covet when they go to concerts so why not make it a reality for your guests. 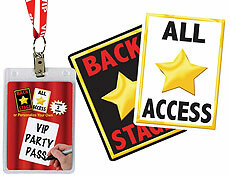 Have your invitations or save the dates be custom lanyards with backstage passes attached that show that they can party like a rockstar with a you at your party. Every concert and rockstar area has a “green room”. This is what the backstage is all about. This is where the band and their groupies hang out before, during and after the show. Usually the food is waiting there for the band through the night so that any time there is food available for them or their people to enjoy. Popular items in backstage areas are chicken fingers, sandwiches, candy, water, assorted sodas and drinks, candy bars. It’s all laid out nicely so that everyone can enjoy the food all night. Mimicking this feel by having a green room for your guests to refresh themselves in or green area complete with lounge chairs and loungey bean bags would be a great way to complete the rock star vibe. Drinks are an important part of the rockstar vibe. There is a clear drink to have, Rockstar energy drink is an ideal choice to have available. So are mocktails or cocktails for your guests. Bottled water is crucial to keep everyone hydrated. Caffeine is important because you want everyone to be able to stay up and party hard. The combination of these drinks will definitely help you stay up all night and party like a rockstar. To party like a rockstar you need lights and lots of them. Lighting is what makes rock concerts fun, club experiences exciting, and can transform any space into something exciting. 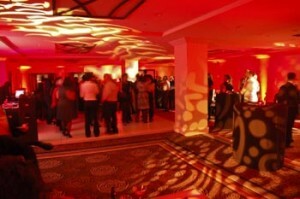 There are a number of ways to get lighting incorporated into your party. DIY sweet sixteen party lighting is the most economical choice. 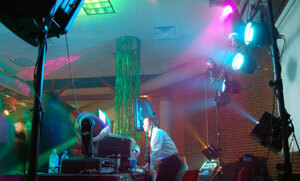 Companies will ship you all the lights and things that you need to transform your venue. Or you can find local lighting companies to rent from. 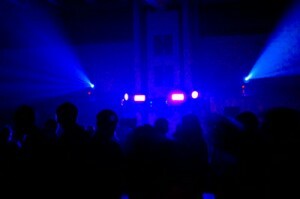 Another option is to hire someone to do the lighting for your party. The most exciting types of lighting are ones that move. Big concerts on TV use moving lighting either scanners or moving head lighting. Moving head lighting are computer controlled units that scan, flash, strobe, change patterns, shapes and other wise add energy and excitement to an event. Scanners are mirrors that do all of the above but don’t move as much or have as much control. Hiring a lighting company to provide lighting is the best option for these lights, cost to buy is expensive and requires someone to set it up and run it all night. Another option is battery powered LED uplighting. This type of lighting can get your party colors into the room and create energy through changing colors, strobing and otherwise moving and blending with the music to create the ultimate rockstar vibe. LED lighting can be expensive and should be provided by a lighting company or event company who can handle these types of light fixtures. Life size custom cardboard cutouts can be a great way to have guests arrive and find cutouts of famous rockstars or famous people they can pose for pictures with. This can be a great way for your guests to break the ice once they arrive and get them in the mind set of looking good and posing for photos. Hiring a local actor to play a famous person who interviews guests on camera can be a cool way to create a memorable evening but also to create a way to remember the event by catching all of your friends on camera as they arrive. When you watch a concerts and other events on TV, many times they place strobe lights in the audience to simulate photos being taken. This helps get the energy up so it always looks like people are getting their photo taken even though they may not, it looks great and can help juice up the energy for an event. They sell mini-string strobe lights that that are great for this purpose. Photographers are crucial for pulling off this type of a party and entrance. Making sure that you’re friends bring their cameras is important. Hiring a photographer and an assistant would be a great way to get that glamourous rock star feeling. Make sure to tell your photographer what kind of party it is so they can dress appropriately and shoot in that style. When your guests arrive you’ll get a great professional quality photo of them to keep and they’ll love the fact that they get a really great picture of themselves looking their best. Throughout the night make sure they work the room taking everyone’s photos. 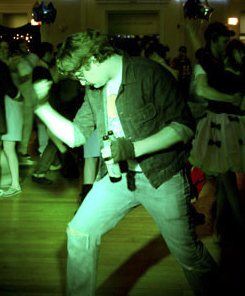 A party like a rockstar theme party can be awesome, one of the biggest, loudest, and in your face parties you can throw. Some great places to have it are places around your area that feature live music. The picture to the right features red uplighting and texture lighting to create the cool rockstar like lounge live. You can get these venues and reserve them for your own party and you can get that exclusive rock feel. Make sure that you dream big and think large so that you can truly party like a rockstar!